Guided by a Noble pilot, an Imperial Knight moves with a speed and grace that should not be possible from such a towering engine of war. 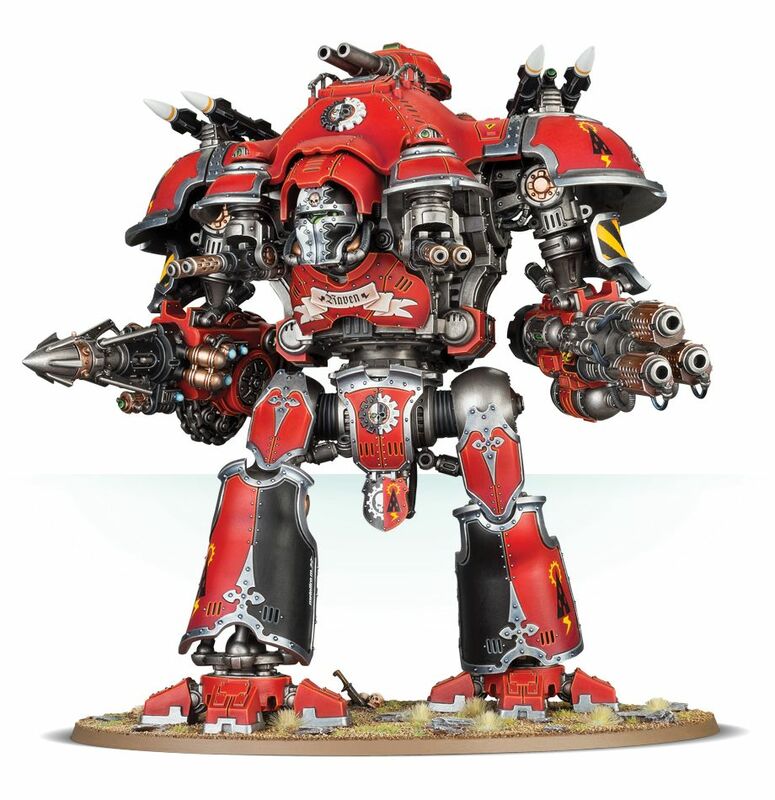 Enemy fire pinging harmlessly off its thick armour, ion shields flashing with brilliant light, the Imperial Knight unleashes incredibly powerful weaponry, able to wipe entire battalions off the map with a single volley of explosive chain-gun fire. Should any enemy survive this bullet hell, the Knight also wields terrifying close-combat capabilities - smashing through the thickest armour with its enormous gauntlets and crushing foes under its massive feet. To see a squadron of Imperial Knights is to gaze upon the full splendour - and might - of the Imperium. 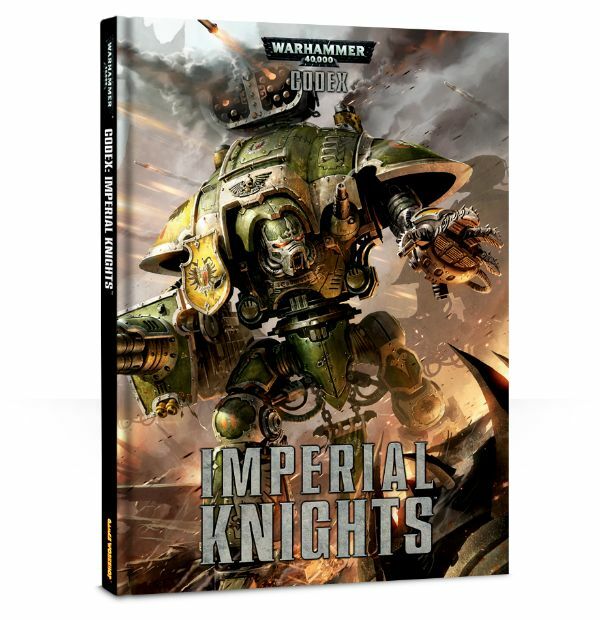 This 120-page, full-colour hardback book contains: Full rules for five Imperial Knights: Paladin and Errant are joined by three new types - Warden, Gallant and Crusader; Two unique Detachments – the Household Detachment (Primary Detachment of Imperial Knights) and the Oathsworn Detachment (an Allied Detachment of Imperial Knights); Extensive background material, colour schemes and heraldry for Imperial Knights from a number of different Knight worlds; A new system of ranking, with rules and bonuses available for using their formations and detachments; Five entirely new formations, allowing you to field efficient squadrons of Knights. #GAW 54-01-60 - Price: $ 41.00 - $ 32.80 On Sale! #GAW 54-13 - Price: $ 75.00 - $ 60.00 On Sale! #GAW 54-14 - Price: $ 170.00 - $ 136.00 On Sale! #GAW 54-15 - Price: $ 157.00 - $ 125.60 On Sale! The Knight Castellan can be likened to a towering fortress, a bastion of Imperial might garrisoned by a single Noble lord and armed with an array of weapons so fearsome that they can tear the heart from an invading army. It is the foremost artillery platform within the lances of the knightly houses, hammering the enemy at extreme range from the moment the fight begins. With its dual plasma core sending energy surging through its huge frame, the Castellan can mount a frightening amount of weapons systems while maintaining its ion shield against incoming fire. They are employed to punish those dishonourable enemies who cower behind veils of arcane energy or the massed ranks of lesser warriors – after all, as the pilots of the Knights Castellan are fond of saying, there is no escape from the Emperor’s wrath. This multi-part plastic kit contains the components necessary to assemble a Knight Castellan. An enormous super-heavy walker sharing a basic shape with a standard Imperial Knight but expanding upon that basic structure with more armour and a number of weapon upgrades, this Knight variant focuses on devastating long-range artillery strikes. In the box you’ll find 2 frames of components making up the main bulk of the Knight: the torso assembly, the shoulder sections and the legs (which are designed to be modelled on either side of the Knight, allowing some posing), along with 2 sets of shieldbreaker missiles, 2 siegebreaker cannon and 2 twin melta guns. A frame of upgrades is included – this features a volcano lance and plasma decimator which attach to the arms, a head and mask which are unique to this Knight variant, and special chest and groin armour. There’s also an immense carapace, extended in order to fit all the weaponry, and an engine block standing at double the standard height, with 2 power cores and 4 exhausts. #GAW 54-16 - Price: $ 170.00 - $ 136.00 On Sale! #GAW 54-17 - Price: $ 75.00 - $ 60.00 On Sale!